The Labour Friends of Israel group had accused him of "seemingly misleading the public". Mr Burgon said he would not use the "simplistic language" again today. What's the difference between anti-Semitism and anti-Zionism? When asked on the BBC's Daily Politics show whether he had said Zionism was the enemy of peace, he replied: "No and it's not my view". "I didn't make those comments, I asked when I was meant to have made those comments. No one could tell me and it's not my view", he said at the time. "So if it's not my view, I wouldn't have made those comments", he added. However a new video shows Mr Burgon saying: "The enemy of the Palestinian people is not the Jewish people. The enemy of the Palestinian people are Zionists, and Zionism is the enemy of peace and the enemy of the Palestinian people." In a statement, Mr Burgon said he did not "recall" making the remark when asked about the 2016 newspaper reports, and had asked for details of the quote. "I received no reply, so I believed it was inaccurate to have claimed that I had used that phrase. It is now clear that I did and I regret doing so", he said. "As I have subsequently said on numerous occasions when asked about this, I do not agree with that phrase", he added. "The terminology has different meanings to different people and the simplistic language used does not reflect how I now think about this complex issue and I would not use it again today". Journalist Iggy Ostanin, who released the video, said the footage was from 2014 - before Mr Burgon was elected as MP for Leeds East at the 2015 general election. Mr Burgon said he had been criticising the "aggressive expansionist policies" of Israeli Prime Minister Benjamin Netanyahu. In the video, Mr Burgon also called for MPs who are members of Labour Friends of Israel (LFI) to resign from the group "in support of the Palestinian people". 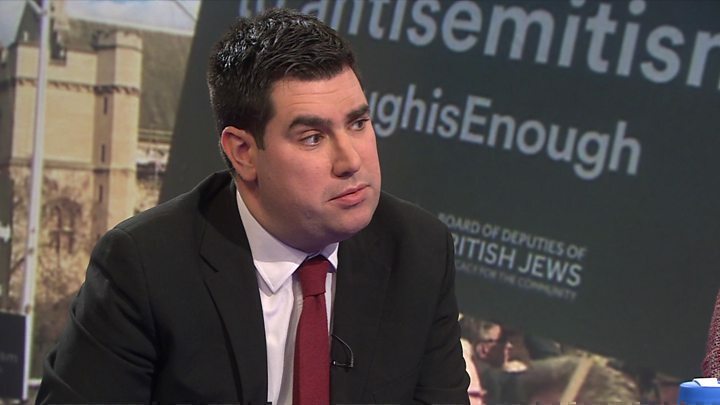 LFI Director Jennifer Gerber said: "For nearly two years, Richard Burgon has deployed half-denials and weasel words to escape responsibility for his appalling suggestion that Zionism is the enemy of peace." "Now that we've all seen exactly what he said, it's time for Mr Burgon to apologise both for this slur on the Jewish people's right to self-determination and for seemingly misleading the public about it". "Somebody who aspires to be one of the country's leading legal figures simply cannot behave in this fashion." Amanda Bowman, Vice-President of the Board of Deputies of British Jews, said Mr Burgon "should apologise for his comments and for his denial of them". "Richard Burgon's denial and the subsequent revelation of his 2014 incitement against Zionists encapsulate the total sham of Labour's approach to anti-Semitism", she added.